With its compact size, the LV140 single float, liquid level sensor is ideally suited for use in steel double-wall tanks or containment sump areas. It requires no calibration, and is easy to install and maintain. When positioned vertically at the bottom of a steel tank’s stand pipe or in a sump, it reliably senses the presence of a liquid. It detects hydrocarbons and water as low as 3 /4 " from the bottom of a tank or sump. The LV140 sensor features an epoxy encapsulated design providing an environmental seal, making it a fine choice for harsh environments. An integral slosh shield guards the float from debris, thereby assuring dependable service. The LV140 universal liquid level sensor operates on a direct, simple principle. A float is equipped with powerful, permanent magnets. As the float rises or lowers with liquid level, it actuates a magnetic reed switch mounted within the stem. This condition either opens or closes the electrical circuit to operate an external alarm or control circuit. 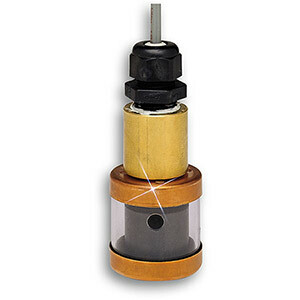 When mounted vertically, this basic design provides a consistent accuracy of ± 1 /8 inch. At the heart of the sensor is a durable reed switch to ensure long, trouble-free service. Hermetically sealed, these switches provide precise repeatability, with actuation points that remain constant over the life of the unit. Note: The LV140 sensor is a non-voltage- producing device and does not contain energy storing components. However, since primary use is in hazardous locations, an appropriate intrinsically safe (I.S.) interface device is required for its use. 참고: Comes complete with 25 ft. two (2) conductor PVC or PFA jacketed cable and operator’s manual. For normally open switch add suffix “-NO” to the part number; no extra cost.